Capsule Summary: Hawkeye treats a wounded North Korean soldier, prompting outrage from a G.I. and a visit from Colonel Flagg. This was the last episode of M*A*S*H to feature Colonel Flagg, although the character later resurfaced in an episode of AfterMASH. Edward Winter made six appearances as Flagg between 1973 and 1976 (five if you don’t count “Deal Me Out” when he was credited as Captain Halloran). Why the big gap between this episode and “The Abduction of Margaret Houlihan” back in Season 5? And why was this Flagg’s last appearance? I don’t know for sure but presumably the writers felt the character had run its course. It may have been for the best. Edward Winter did a fantastic job as Flagg but there were only so many ways to get the character to the 4077th and only so many things for him to do once he was there. Indeed, Flagg’s role in this episode is basically the same as in many of his previous appearances: he’s convinced someone at the 4077th is a Communist. What makes “Rally Round the Flagg, Boys” stand out is not necessarily Flagg but the interaction between Flagg and Charles. But the two meeting, Flagg trying to convince Charles to spy on Hawkeye, and Charles ultimately refusing to do so could happen just once. Were there ways to bring Flagg back to the 4077th later in the series? I’m sure the writers could’ve come up with something if they really wanted to but it likely would’ve felt repetitive. This was a strong episode for the character to go out on, in my opinion. Flagg did his homework before meeting Charles. He knew exactly what to say to frighten and entice Charles into working with him. Of course Charles would jump at the chance to not only get away from the 4077th but out of Korea entirely. But even Charles wasn’t selfish enough to go along with Flagg for long. He masterfully turned the tables and pulled one over on Flagg. Even Hawkeye was impressed. Speaking of Hawkeye, his storyline is a little disappointing. It ties into the Charles/Flagg storyline in that both involve the wounded North Korean soldier. But it just ends. Hawkeye decides to operate on the wounded North Korean soldier and feels justified in that decision. He gets really upset in the O.R. when Basgall won’t stop yelling at him. Later, Hawkeye feels bad about yelling at Basgall but B.J. refuses to let him apologize. Basgall then confronts Hawkeye in the Swamp, forcing B.J. to get a little rough. Then what happens? We don’t know. Basgall is sent back to Post-Op and that’s the last we see of him. Hawkeye never gets to apologize or reflect on the experience. In the tag scene, B.J. visits Father Mulcahy to get a boxing lesson, wanting a way to blow off steam so he doesn’t rough up any other patients. But what about Hawkeye? 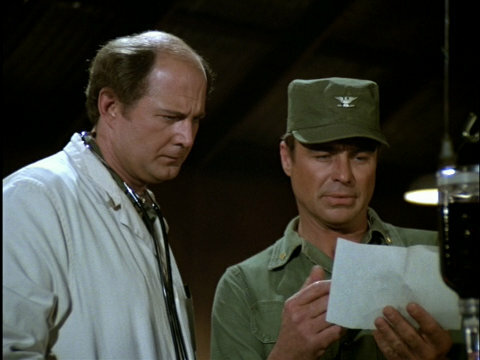 Charles and Flagg study the map. I wonder how many times Goldman tossing his lunch in the garbage had to be shot. There’s no jump cut so presumably Edward Winter really was in the garbage can and really did get a a tray full of food thrown at him. When Colonel Flagg turns out the light in the Swamp, there’s a momentary freeze frame while the tent is dark and Flagg makes his escape. Can anyone identify the magazine Charles finds in Hawkeye’s footlocker? From what we see of the cover it looks like it’s called FUN. Was it a real magazine or something the prop department came up with? Every single guest star in this episode made at least one other appearance on M*A*S*H.
Margaret does not appear in this episode. Margaret makes an appearance in the O.R. scene that somehow I completely missed. Thanks to Doc Funnypants for pointing it out. Ken Levine has said before that the reason they stopped writing for Flagg was because he was becoming too broad and silly a character, and that he would have ended up becoming an ill fit for the show given the shift in tone it was going through. And the reason Hawkeye took the North Korean casualty first was because he was hurt the worst and needed surgery immediately. And I just recently realized the guy who played Basgall was the same patient in “Tea and Empathy” whom B.J. tried to cure of his morphine addiction. FLAGG: Pierce! I’m going to give you a change: why’d you do it. HAWKEYE: Oh, I don’t know, why does anybody do it? FLAGG: Now you’ve done it! HAWKEYE: Well you’ll have to clean it up. FLAGG: Now, you took a yellow Red before a white American, which is pretty pinko. HAWKEYE: You’re even boring in Technicolor. Actually, Margaret does appear in this episode,albeit briefly in the OR. The episode was amusing with Flagg and his extreme paranoia,but one thing does bother me concerning this episode. The tag doesn’t really connect with the rest of the episode. I can’t believe I missed Margaret in that scene. B.J. even calls her by name. – Why do we even bother treating and saving enemy soldier? That is super simple to explain to him. We can trade captured soldiers with the other side. The more we save the more POWs we can have returned to us. If we just let them all die, then the enemy will do the same. No more Rainbow Bridges. – Oh yeah, I completely forgot! They are actually human beings too! (Don’t get me wrong, I do believe there are actually reasons and principles worth fighting, dying and killing for although I’d be happy if any other option to resolve the differences is tried first). Maybe this episode could have covered those meaningful feelings and issues and everyone could gained some perspective on things (like was done with the enemy gorilla episode where BJ and especially Hawkeye are shown to be far too naive. I really appreciated the fact they did that. 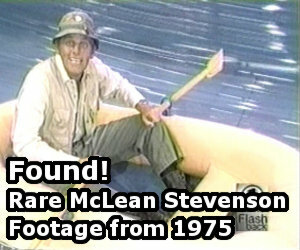 Their (and Trapper’s during his time) naivete has always been far too childish in my opinion. Don’t get me wrong though, I love the show lol. Is this the episode where Flagg and Mulcahy have the most interaction? The one where Potter and Mulcahy come in the C.O.’s office, Potter asks where Flagg came from and Mulcahy replies dryly, “Certainly not from above.” And when Mulcahy tries to leave, Flagg snaps at him, “Freeze, Mr Vatican, no one moves til I do!” , and where Flagg asks Mulcahy, “Who sang Toora-loora and Going my way?” When Mulcahy replies “Bing and Barry”, Flagg retorts with, “Okay, you’re clear..for now”, and stalks off as Mulcahy rolls his eyes at him. That last scene seems to imply that Flagg will target Mulcahy soon, but he never does. A pity, I think, since Edward Winters was a riot, and William Christopher was hilariously funny when they gave him the script material for it. For proof, see Mulcahy’s drunken sermon in “Alcoholics Unanimous”…so funny! IMHO, they should have had a scrpt where Flagg comes to camp and tries to prove Mulcahy is communist because he helps orphans from both sides in the war, which leads to a crazily funny court-marshall hearing. It would be a riot to see “The Wind” and “The Padre” pitted against each other! The Flagg episodes are some of my favorites. So what if he was silly? The show could have used the silliness in some of the later super serious episodes. They could have juxtaposed his silly pointlessness with the horrors of war which I think they were doing here. Either way I’m sorry to see Flagg go. His type of humor is the Henry Blake type that’s impossible not to laugh at. The overreacting and anger at everything is hilarious. If it is true that the North Korean was one of the people shooting and maybe killing our people it makes very little sense that they would bring him to an American medical unit. They have their own doctors as we learned in a previous episode. It is in very poor taste for any medic to pick up the guy who probably has American bullets in him and transport him with guys he shot. However it’s possible he wasn’t in any involved and was a random guy who caught some fire. Hawkeye’s self righteousness was again in rare form again here.